Gloppy dressing full of preservatives. It certainly wasn’t for the end consumer of coleslaw. That is exactly what was available for delis and restaurants 20 years ago. You could make it fresh everyday like you’d do at home or in chef-led kitchens, but for quick serve chains, that was a cumbersome task to be added to all the other things needed to keep operations running. For this time the solution was pre-made coleslaw which was difficult to like and didn’t taste great — all those copious preservatives producing the “gloppiness factor” stuck rather well to the cabbage. If necessity is the mother of invention, then this gloppy dressing spurred on a little bit of innovation that we now see today. Let’s go back 40 years. At that point in foodservice, produce was still taking its baby steps with chopping and preparation being handled back of house. But with the arrival of franchising, other facets of food preparation were beginning to be standardized, from recipes to ready-made items that took brand recognition from the sign on the street to the flavor of the food you were ordering. In the mid 1970’s shredded lettuce started showing up in fast food chains bringing produce into the revolution that was going on with food preparation. The man who started chopping lettuce out in California was driving through Oklahoma when he made a call. Some accounting miscalls took him out of business for a decade and when he was back in society, made his way to Oklahoma. Mark Vaughan got a call from him over the phone, “I know everything about you and want to work for you.” That was the beginning of a mentorship in fresh cut processing that ushered in innovative thinking into Vaughan’s future business, Vaughan Foods. One thing about innovation is new opportunities and needs start to pop up and that is what happened 20 years ago with coleslaw. 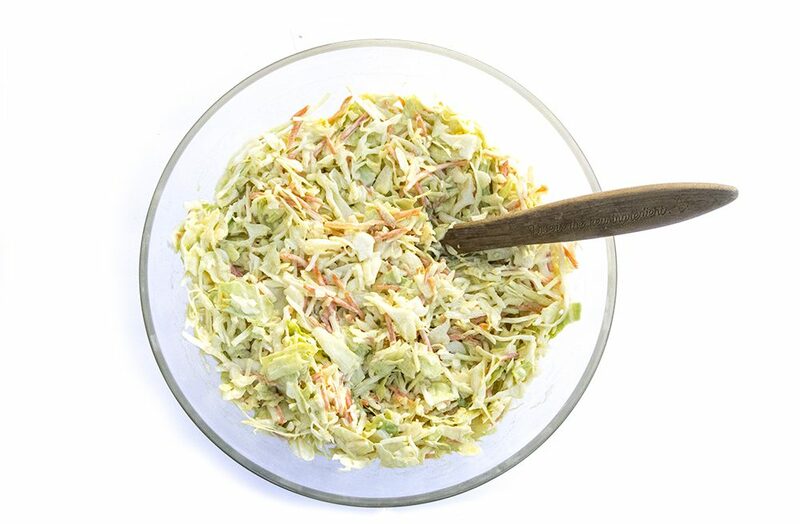 There were a few different issues going on, you had that gloppy pre-made coleslaw, but it did not have a great taste or texture with so many preservatives in the dressing to slow down spoilage. But freshly prepared coleslaw had its own disadvantages for busy kitchens with the work that went into it. The first issue was cabbage and carrots had to be prepared and chopped daily. With the advent of fresh-cut produce, that step was now easier in addition to more consistency with the final chop of the cabbage. The dressing also was made daily. What happened is variations started showing up across the locations of a restaurant chain. A customer eating at location A may or may not get the same coleslaw as location B, and consistency in expectation was a big part of the success of these chains. Another issue was storage of the ingredients. The produce was kept in the cooler, the dressing elsewhere. It created another step to find the ingredients to mix. A dressing with less preservatives also required refrigeration, and wasn’t always given that. That was what was happening in the world of deli and foodservice with Vaughan, one of the first to pioneer and launch these kits into the market. 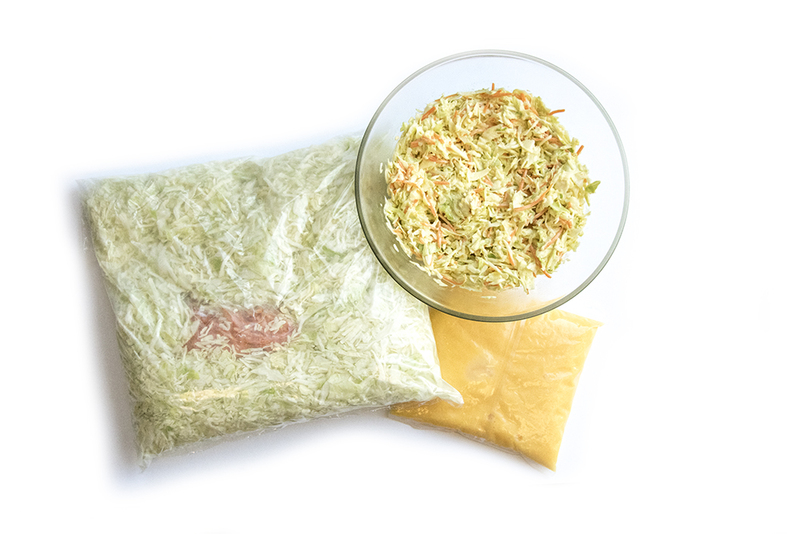 Coleslaw was the first and the kits began to become more complex with multiple ingredient packets, and new flavors and combinations were explored. Vaughan’s broccoli kit contained bacon, raisins, and sunflower seeds in addition to the dressing that tied it all together. From that point, adaptation of fresh cut kits grew and like any other great innovative idea, was deployed by other industry players until it became standard practice. Today those with recent careers or those starting out in foodservice may not realize the issues that shaped kitchen operations in the quick serve industry. Then there are still some chains struggling with these issues and finding a great solution in fresh-cut kits. Since then Vaughan has partnered with GreenGate Fresh, once again on the same evolutionary path that source processors take as they grow and create more value to customers; processing fresh-cut lettuce items and cabbage, then taking those fresh items and combining them with dressings and trimmings to form kits. It’s an exciting path to be on once again, this time backed by experience from Vaughan’s early career. It makes you think, what creative flavors will emerge in the future for this partnership, and will another gloppy dressing bring about even more fresh-cut invention? Time can only tell. 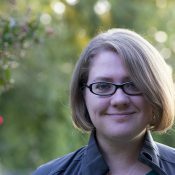 Amber Parrow is the marketing director for Fresh Avenue, a group that represents produce farms and producers with national sales and marketing.